Liam Dobson (left) of the University of Maine returns to the huddle during Saturday's Football Championship Subdivision second-round playoff game against Jacksonville State at Alfond Stadium in Orono. ORONO, Maine — The University of Maine’s coaching staff liked what it saw on the football field when recruiting 6-foot-2, 330-pound offensive lineman Liam Dobson. But it was something he did on the basketball court that really sold them. The Black Bears landed the native of Ottawa, Ontario. This fall, in his first season as a starter, the sophomore right guard was chosen to the All-Colonial Athletic Association second team. Dobson and the line helped the offense rack up 427 total yards and eight touchdowns in Saturday’s 55-27 Football Championship Subdivision second-round playoff win over Jacksonville State. The 9-3 Black Bears, who are averaging 32.6 points per game during their five-game winning streak, visit 10-2 Weber State at 8 p.m. Friday in a national quarterfinal in Ogden, Utah. 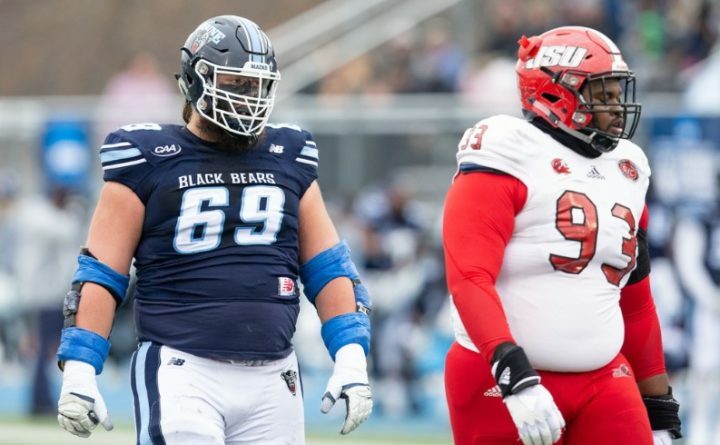 Harasymiak said Black Bear coaches believe Dobson has a good chance to play in the NFL someday. Dobson, who attended Canada Prep Academy, has been an offensive lineman for only three years. “I was a defensive lineman and a fullback until halfway through my senior year in high school,” explained Dobson, who appeared in six games last year. He said senior tackle Cody Levy has played an important role in helping him make the transition to the O-line. “I had to learn the position and the systems,” Dobson said. “I followed Cody’s lead and did everything I could. He has been a great teacher,” he added, praising Denecke for his leadership. Dobson wasn’t lacking for physical attributes, but said learning to execute the details of the blocking techniques was his biggest hurdle. “It was more about (understanding) the schemes and the techniques. You have to take the right step and the right angle (to execute a block),” he said. Dobson previously played by Canadian Football League rules, which are quite different than American rules, at his first high school before transferring to the Canada Prep Academy in Welland, Ontario, where they use American rules. “We went to the (United) States every week. We played teams in Ohio, Pennsylvania and Maryland. Some were nationally ranked,” Dobson said. He started for the Canadian Under-19 team and was chosen the lineman of the year and high school athlete of the year in high school. He was the defensive Most Valuable Player of the AIA All-Star bowl game. When he came to UMaine on his visit, he said it reminded him of home as there was snow on the ground. He also clicked with the coaches. Dobson has been pleasantly surprised at the progress he has achieved in two years but credited the coaches and Levy for their guidance. He said he hopes to step into a leadership role after Levy graduates next spring. Denecke said Dobson and the offensive line has worked hard, individually and collectively, and continues to get better. “They’re built for December football. We can run the football and take our shots (passes) downfield. I’m proud of all of them,” Denecke said. In addition to Levy and Dobson, the other members of the offensive line are sophomore center Chris Mulvey, sophomore left tackle Gunnar Docos and junior left guard Migel Garcia. True freshman Michael Gerace has played both left guard and center. On Saturday, Dobson and the line protected sophomore quarterback Chris Ferguson, who is nursing a sore throwing shoulder that forced him to miss parts of the last two regular-season games. He was sacked only once and threw five touchdown passes, a UMaine playoff record. Mulvey and Levy were the only linemen with extensive starting experience at the outset of the season. “There were questions about the offensive line (at the beginning of the season) but we really proved ourselves in that game,” Levy said.